Compac has sold more lanes of Spectrim for citrus than any other category. 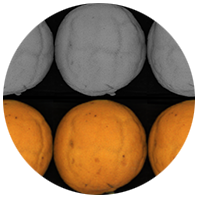 Citrus grading improvements are an important focus for our Research and Development team, and as a result, the team is working on clear rot detection and developing and testing an improved solution for creasing on oranges. Creased oranges are a structural defect in oranges where the fruit skin comes loose, resulting in puffing in some parts and creasing in others, leading to the North American term ‘Puff and Crease’. This is a major problem for packhouses, as when the fruit is packed in boxes and transported, the weight can lead to fruit splitting. 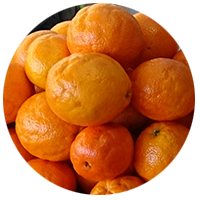 Subsequently the fruit rots and the whole shipment can significantly deteriorate through the supply chain. Seemingly good shipments can then arrive spoilt at their destination. The other major problem for packhouses is that puff and crease is very intermittent. Packhouses need to carry an extra overhead of manual graders throughout the entire citrus packing season, or slow down the packing line, for the few times it occurs. Both result in increased labor cost per pack. Some markets have a healthy local market for minor to moderate creased fruit while others do not. This ranges from the North American market where no creasing is allowed in export grades, some minor creasing in domestic grades, and some moderate creasing in Domestic Choice grades. Whereas in Australia, creased fruit is not acceptable in any packable grades. This means that any algorithmic solution needs to be both sensitive to crease detection and flexible in how to grade it. Most packhouses rely on manual grading for the majority of the texture grading. Relying on the inherently subjective human eye to grade, compounded by the difficulty of seeing creasing as fruit is moving on grading tables, results in variable grade accuracy. Like clear rot detection, we want to provide a single cabinet consistent solution to our customers. With such a large challenge, many equipment vendors (including Compac) have attempted a wide range of solutions from dedicated cabinets to blunt algorithms. These have demonstrated some value in pre-grade configurations, but none have achieved enough success to address the above issues of additional labor and slower speeds to reduce cost per pack. Because of this, we have spent the past few seasons investigating how we can deliver a more consistent and accurate solution. The Spectrim platform has been designed to be flexible and upgradeable to meet both current and future needs. This allows the Research and Development team to look at both revolutionary (such as SmartMap) and incremental improvements to the Spectrim software product. Leveraging the revolutionary SmartMap features with new algorithms has allowed us to make significant improvements to crease grading. Part of improving our product comes from working with customers from different parts of the world to find solutions to their grading challenges. We found that IR was the best wavelength for detecting creases and have made having at least a CIR system a requirement to use the new creasing algorithm. Fortunately, Spectrim CIR and C2IR systems are already a great choice for citrus packers and many of our existing customers only need a software upgrade. Each system (CIR and C2IR) offers benefits over a color-only system. Spectrim CIR is more advanced and improves the grading of rot, punctures, pulls, splits and katydid over a Spectrim Colour system; while Spectrim C2IR improves on the grading clear rot, pull, splits and other rots over a Spectrim CIR. The new creasing algorithm has been developed to fit into the existing grading workflow to minimize training. It has a new blob detector, called Crease, which is designed to find potential creases on the fruit. We have then created new features to be used by Spectrim’s powerful machine learning tool SmartMap. 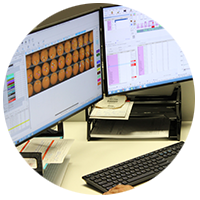 Like other blemish grading, you follow the normal process: detect, identify and grade the whole fruit using blobs, SmartMap and Classified Blob rules. Spectrim’s software allows for a great deal of flexibility in which blemishes you can grade and how you grade them. We recognize that our customers and their staff have a great deal of fruit knowledge and understand the requirements of their own customer base. Therefore, we provide you with a flexible tool which can be applied to meet individual requirements. Validation testing in California has shown that Spectrim cabinets using the new software are able to correctly grade most severe creasing that should be sent for juicing, with some juice grade fruit ending up in the Choice grade. The majority of the more moderate creasing is also being correctly downgraded to Choice with a small amount downgraded to Juice and the rest in higher grades. Only limited detection of light creases was achieved with about a third of the lightly creased fruit correctly graded. This new algorithm removes the worst of the creasing from the domestic and export grades, allowing manual graders to concentrate on the marginal creasing cases, while supporting a more consistent end product for consumers. Based on experience with a market less tolerant to creasing, like Australia, we would expect that some of the minor creasing, most of the more moderate creasing, and the majority of the severe creased fruit should be correctly sent to Juice without any manual grader effort. The benefits of this new creasing algorithm are significant, such as enabling packhouses to run at much faster speeds on highly creased batches. Previously, throughput was sometimes reduced by up to 40 percent to allow manual graders to individually grade every creased orange by hand. With the confidence that the lower grades have a consistent creasing grading you can reduce the number of manual graders on these lines. Wesaw this firsthand while testing. 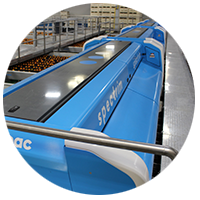 Once Spectrim was grading consistently, the line manager moved to only having one grader on the Choice drop and none on the Juice drop; reducing manual graders by approximately 50 percent. The grading of creasing is very subjective, more so than many other defects - I have seen one grader down grade a fruit only for another grader to then upgrade it. Humans are naturally good at making decisions based on fuzzy criteria and are hugely adaptable with the ability to apply common sense to new defects and fruit variations. But humans are both inconsistent with each other and themselves over a shift as fatigue sets in. The new creasing algorithm using SmartMap tools, allows your operator to set defined cut points and adjust as needed. Removing creased fruit from grading tables greatly reduces the cognitive demands on your staff, helping to keep them alert for longer. Spectrim can provide an objective standard for grading all day every day. The other improvement is to do with labor utilization which will reduce the cost per pack. By automating you can run the system at your normal operating speed with no need to slow down when a creased batch is hit. By reducing the amount of creasing in a pack, the risk of splitting and spoilage is also reduced, leading to lower chances of lost revenue, and more importantly, helping protect brand loyalty and assist with future sales. This is just one of the many Research and Development projects which we have been working on to enhance the offering from our Inspection systems. Both in software such as this Spectrim enhancement, and in hardware with the launch of Inspectra2 and Cherry Total View upgrade. With the twice yearly Spectrim software updates, our customers can look forward to a range of new features rolling out for different commodities. Talk to your nearest Compac sales representative for more detailed drop statistics and to schedule a slot for an upgrade and to train employees on the new features.